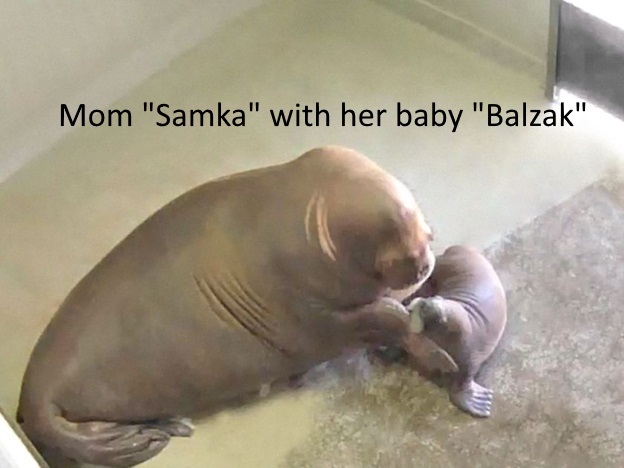 On June 29th, Samka, the mother of the young walrus, Balzak, died about 1.5 years after her baby was sent to the Vancouver Aquarium from the Quebec Aquarium. “The cause of death is to be determined but can it ever be ruled out that after mourning having her baby taken away from her she finally succumbed to death from a broken heart? Grief is not only a human emotion. It is seen in both domestic and wild animals. The orca Bjossa at the Vancouver Aquarium would not let staff remove her third dead baby from the pool,“ stated Peter Hamilton, Lifeforce Founding Director. Is this rebranding as a “Research Outpost” an attempt to brainwash the people into thinking that questionable experiments on sentient wildlife should be condoned for human profits? A goal as they say is to use "captives and rescues as untapped resources". That can include cetaceans too! At the end of the day and depending on how long the walruses will survive, the aquarium will only know about captive walruses. Continued studies of wild walruses will provide the true information that will hopefully help humans understand and respect their freedom! Why did it take 1.5 years before they showed the walruses to the public? They cannot always get wildlife to cooperate by with food deprivation and other methods! Taking these walruses away from their moms broke their precious bonds and was cruel. They can nurse up to 3 years but were taken away at 1.5 years. Why? Was it to get the moms pregnant again to supply aquariums with babies to exploit others for entertainment and experiments? UBC has abducted at least 22 two week old baby sea lions from their moms and six Fur seals to use in experiments at the Vancouver Aquarium. In other experiments with 2 dolphins the aquarium researchers tried to force them to wear blinders and after over a year they gave up on one of them. The US Navy is also among their associates. To protect ecosystems scarce funds must be spent on protecting natural habitats not spending billions of dollars building aquarium and zoo prison laboratories. The World Wildlife Fund found that a diversity of wildlife populations have been reduced to 48% from 1970 to 2010. The aquariums and zoos had failed with their “conservation” propaganda! Sadly, that has been at the cost of sentient wildlife suffering under the guise of “conservation”!